My e-book is a compilation of newspaper stories of shark attacks in New York, New Jersey, North Carolina, Hawaii, South Africa, New Guinea, and Australia. Perhaps readers are unaware of the dangers of swimming in inlets, like those that empty into the open waters of Raritan Bay. At times sharks venture into shallow inlets in pursuit of small fish they feed on. Humans can be mistaken by sharks for bait fish, especially their extremities, i.e. arms and legs. Among the individuals profiled in the news accounts, is one who was an experienced swimmer in the Atlantic Ocean. 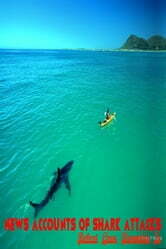 Scientists believe he may have become the victim of a shark because the ocean water was warmer than usual. Readers will profit from reading about the many variables which make people more likely to become the prey of sharks. Men are many times more likely to be attacked than women. However, a number of women who were bitten severely by sharks are chronicled in these newspaper features. Hopefully, swimmers, snorkelers, scuba divers, and surfers who read "Newspaper Accounts of Shark Attacks" will exercise more precaution after having learned the details of these tragedies. How to Select, Equip and Maintain a Cruising Boat. The Series.